ManriqueGaby: From Hater to Congratulator. Excuse the Ebonics. From Hater to Congratulator. Excuse the Ebonics. It has become crystal clear to me that being a hater gets you nowhere and it gets you there fast. And well, I know this from firsthand experience and from witnessing other hater-friend's of mine join me in Nowhere. My name is Gaby, and I'm a recovering hater. I'm now motivated to find the positives and to try as hard as I can to see the good in everything. I'm sincerely impressed by the ability of Fifi Lapin to create an illustration that people all over the world relate to. I think it takes great personal power to connect with other individuals through any art form and Fifi Lapin has definitely accessed her power. 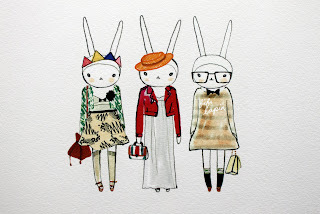 I do indeed admire Fifi Lapin and coming across her blog has helped me change my point-of-view. It actually feels good to "Admire & Praise"